While some employers believe Christmas is a distraction to the workplace there are many benefits of celebrating this time of year. Adding Christmas decorations throughout the office can add festive cheer to any workplace, as well as being a great way for employees to express their creativity. Having a Christmas tree (or two) at work is one of the best/easiest options. You could have two different options. A standard Christmas tree and do a secret Santa with your colleagues. Or organise a ‘giving tree’ under which management and employees can donate gifts to charity. Apart from Christmas Day itself, the office Christmas party is an event that many often look forward to with much anticipation. Make it exciting. Hype it up so everyone is excited for it by the time it arrives. 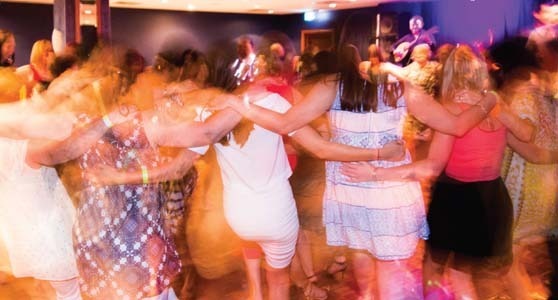 The Greek Club is the perfect Christmas party for something different. With a three-hour Beveridge package, Greek buffet, a Greek live band, belly dancing show & Hellenic Greek dancing the entertainment is endless. Click here for more information or to enquire. Office days out can be a huge success when planned well. What better way to celebrate and get into the Christmas spirit then granting everyone a day off from their regular duties to participate in a day of fun at a place other than work? Be as imaginative as you like when planning. Well-chosen activities are good for fostering team spirit and cohesiveness and celebrating all that your company has achieved in the past year. A festive and happy workplace should ultimately be considered a reward to your employees for their hard work throughout the year. It provides you with an easy, inexpensive way to earn employee loyalty, bond with colleagues and have them return positive to the new working year.